With the development of society, more and more people choose wedding tents as a venue for weddings. But many people are worried about the cost. now, let’s learn about the cost of purchasing a wedding tent. How much do wedding tents cost? Wedding tents are widely used around the world. Wedding tents are popular with people in the Americas, Europe, and Asia. Different wedding tents can be chosen according to the customs of different places. Wedding tents can be used as permanent or semi-permanent buildings. We need to know our requirements before choosing a wedding tent because of the impact of price. Common wedding tents have A frame tent and arch tent. Among them, A-frame tent price is the highest cost-effective, while the price of the arch tent is relatively high. Of course, we can also customize some complex shapes according to our own needs. The size of the wedding tent is a direct factor affecting the price. For the calculation of the size, we can calculate it according to the number of people. For example, when we have 300 guests, then we need about 360 square meters tent, which can be calculated according to 1.2 square meters per person. 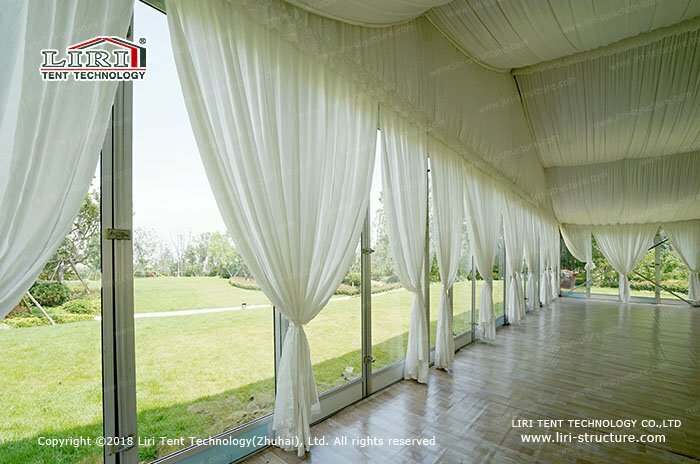 The wedding tent can be decorated with different colors lining and curtain, air conditioner, flooring system, luxury chandelier. Our wedding tent span can range from 3m to 60m, the length can be increased or decreased by 3m or 5m. We also have a different type like geodesic dome tent, two story tents, cube structure tent. 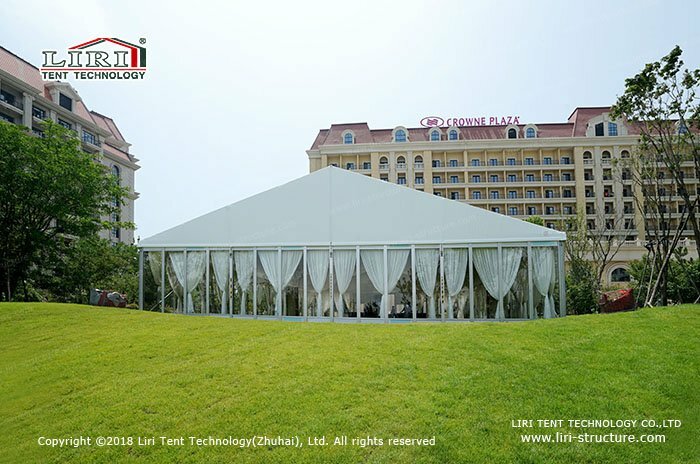 No matter what do you need, Liri Tent can always offer you the best solution for outdoor wedding tent decoration according to the scale and the theme of your wedding ceremony. Also, there is another romantic idea if your banquet is holding at night time like a more and more high-class event such as Dior banquet party, big company clear roof party marquee anniversary celebration. To choose the transparent roof cover and sidewalls tent, decorated with the beautiful lighting system, it will make your wedding romantic and unforgettable. These factors also will have an influence on the cost of the wedding tent. Wedding tent is it can be installed and dismantled easily. You can put the tent wherever you want, and no need to worry about whether if it’s a good date for the wedding, too difficult to get a good hotel for the banquet. Of course, it will charge us some installation expense. The cost of a wedding tent is probably the above. Of course, if you have other needs, you need to arrange some scenes, tables, and chairs, Liri tents also can provide you. Now, do you have learned about the cost of wedding tent? To get an excellent wedding, wedding tents is the best choice.